As usual, every single statement in the comments section is negative. the traffic circle along with the new towers will be a great asset to downtown portsmouth.it's about time they did something to enhance their downtown.norfolk and portsmouth's downtowns will enhance each other.this is good for the whole region. I take the comments in the pilot with a grain of salt vdogg. It seems they are there just to troll. Almost any of those articles with develpment seems to bring them out. It seems that no one has any faith in the city of Portsmouth. What do they want it to do? Sit there and rot? This is a perfect move to the right direction. Traffic circles are great for many reasons. Besides making a statement as a grand entrance to Downtown Portsmouth, traffic circles actually cut down on accidents by circulating traffic without stop lights. I hope they put something awesome in the center. For all those negative comments on PilotOnline, does everyone remember how people used to say the same things about Norfolk 10 years ago? All the negative comments appear to come from outsiders especially those in Suffolk and Chesapeake, the two cities that stand to lose the most if Portsmouth succeeds in its redevelopment. Portsmouth residents posting on pilotonline appear to be strongly in favor of what the City is doing. The deadline for this RFP (also a .pdf file) has been extended to March 1st. Hopefully we'll hear some news by then. With the news we've been getting lately, do we really want know what comes out? Location: Norview in Norfolk, VA. I wouldn't expect 6 huge condo towers to come about now. I'd really be satisfied to see something low-rise but mixed-use and walkable, allowing Portsmouth residents and visitors to enjoy the waterfront and take advantage of some of the best harbor views in the region. In all honesty I'd rather not see a blockade of tall buildings on the waterfront. This isn't the Oceanfront here. 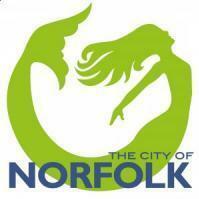 Norfolk's plan for Fort Norfolk stated it best, shorter buildings on the water, stepping up to taller buildings behind. I'd love to see something exciting come of the old Portside area. I thought one of Portsmouth's biggest mistakes was getting rid of that entertainment facility years ago and "redirecting attention" to High Street Landing. The problem with High Street Landing is that, while visitors arriving there are close to the main street of Olde Towne, the first couple of blocks are just parking lots and ugliness. Visitors wonder, "am I lost?" "is there really anything worth walking down this street for?" If attention is to be focused at High Street, make it an active, exciting, and inviting place! What Portside did well was that it greeted visitors right away and was a great hangout for locals. Friday evening happy hours were always lots of fun as people sat outside drinking beer, chatting and laughing. Always a great start to the weekend. When urban planner Ray Gindroz unveiled his plans for revitalizing downtown in 2005, he advised city officials to concentrate first on remaking waterfront land south of High Street. Gindroz wanted city leaders to hold off on redeveloping what he considered Portsmouth's most valuable property - the Holiday Inn site in Olde Towne. Waiting, he told Portsmouth leaders, would only make the land more valuable. Two years later, city officials have scrapped development work on the south side - save for plans to build a Circuit Court - and have instead turned their attention to the hotel at the northernmost point of downtown. This is actually not very good news. This is only one piece of property. The article said that plans for the property that had already had recieved proposals was shelved. And that the property was going to be used for the circuit court building. Exactly what Gindroz warned against. Last year, the North Pier site had been marketed to developers along with a 2.5-acre lot across from City Hall. With the plans on hold, city officials have now earmarked the lot for the new Circuit Court. The publicly-owned property was the cheapest and easiest option for locating the court, Councilman Doug Smith told residents last week. Lynch added that his department is marketing the North Pier site with hopes that another company will submit a redevelopment plan. "That doesn't mean it won't happen in the future," Heretick said. "But given the realities facing us right now, we needed to go to the Holiday Inn site." The circuit court is going on a 2.5 acre lot across from city hall, not the north pier site itself. Do I think we'll get 6 towers out of this? No. Did I ever think we would? No. I've always thought that realistically we may get 3 or 4 at the most once all was said and done and I believe we're still on track with that. I understand what you're saying about Gindroz's plan, and in an ideal world I would've liked to see every single one of his ideas implemented. This is Portsmouth however, they are not a rich city and are just now starting to realize the fruits of their revitalization efforts. Gindroz has a beautiful vision, but at some point that vision has to meet up with reality, and that is what is happening now. Ha. So i'm obvioulsy alone in my enthusiam for the Portsmouth waterfront since no one else but urbanfan has commented on this today. Honestly, I think Portsmouth is making a lot of great strides and I think that this is another step in the right direction (even if it isn't exactly as everyone had hoped for). actually I like seeing redevelopment attention happen to the northern part of the downtown because that would be the easiest part to reconnect back to the rest of the city. Much of the city's focus should be on everything north of the nTelos Pavilion. I think once that part of the city is in order and functioning the way it should, then the rest will take care of itself and more towers will come. Plus I have always felt Portsmouth should target residential housing in their downtown because they already have a commercial core across the river, no need to compete.